Happy Birthday to: Katherine Brucken, Marcella Dent, Kai Carlson-Hillier, and Kelly Collar. From last year’s New Years Eve race. Wonder if we will have that much snow this year? This Friday is the Winter Solstice. Reason to celebrate since the days finally start getting longer. But don’t celebrate too much since it only improves by one second. And, the total daylight by the end of the month (8:55:09) is still less than the total we had on December 1 (9:06:52). But the good news, sunset on 12/31 is at 4:21pm which is better than December 1’s 4:12pm. Here are 8 things to know about the winter solstice. The next newsletter comes out in January. Remember how great the last one was? Your contributions are encouraged and welcome, please send them to Maryke Gillis. She would like them by January 11. Good topics for you to write about: race reports, an interesting race that others may not know about, your favorite places to run in winter, etc. We will be at the Steak House in Berlin on Thursday, January 24th for the annual dinner. 5:45pm for social hour (cash bar) and dinner at 6:30pm. Remember that CVR member volunteers eat for free! You will soon receive a request by email to RSVP and reserve your place. Remember the 2019 Race series starts on New Year’s Eve! The race location is the same as in the past (at the Pavilion). Advance registration is suggested, see the info page here. The race starts in the warm part of the day, at 2pm. We need volunteers for the race, please email Race Director Manny Sainzif you can help. This week’s Winter Long Run will be at the Red Hen in Middlesex on Saturday at 9:30am. Questions about this Saturday’s run, contact me as I am hosting this week. Don’t let the rainy forecast hold you back; we’ll run anyway. For those of you who have run the Amherst 10 Miler in the past (a February race), there is bad news. The Sugarloaf Mountain Athletic Club (who produces the race) has decided to cancel the race this year and re-evaluate whether they want to continue it in the future. Here is their announcement. 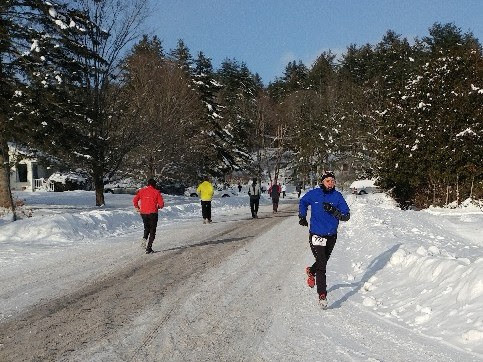 Also another race on hiatus for 2019, the Shires of Vermont Marathon. Merry Christmas, Happy Holidays and Seasons Greetings Everyone! –>December 31, Resolution Run 5K and Walk, Champlain Valley Expo, 3:30pm (formerly First Run which used to be held on New Year’s Day).